You'll be £25.00 closer to your next £10.00 credit when you purchase Sir Alan Cobham. What's this? Flying in the years between the two world wars was the preserve of the powerful and the wealthy, or so it was until Sir Alan Cobham’s ‘Flying Circus’ began to tour Britain. A former pilot with the Royal Flying Corps in the First World War, Alan Cobham continued to fly, establishing air routes to the Empire countries. He also involved himself in aerial photography and survey work, undertook charter flights and pioneered the ‘Air to Air’ refuelling technique still in use today. Yet it was his National Aviation Day displays for which Sir Alan Cobham’s name is best remembered. Affectionally known as ‘Cobham’s Flying Circus’, his team of up to fourteen aircraft toured the United Kingdom, visiting hundreds of municipal locations, allowing ‘ordinary’ people to have their first taste of flying. So extensively did Cobham travel with his displays, and so popular did they become, that after war broke out in 1939, some 75 per cent of Britain’s young men volunteering for aircrew duties claimed that their first experience of flying had been with ‘the Circus’. Sir Alan’s name still lives on in the aviation world. The creation of Flight Refuelling Limited in 1934 eventually led to the formation of what is today a major international aerospace and defence organisation – Cobham PLC. This is an engaging biography that is very well supported by the high standard of illustration. The reader will be left in no doubt that Sir Alan was a remarkable man. The included illustrations are useful and welcome, and the text is well-written, balanced and highly readable. Definitely to be recommended. Historians of several persuasions (including aviation) with an interest in the British Empire during the 1920-1930 period may find this volume of interest, while readers with a more ‘generalist’ interest in aviation, its development and its civil and military applications may also find it of interest, Aircraft modellers may find the images within the book useful to their hobby. Readers without an interest in aviation might also find it worth a read; it is an excellent, unique and well-written story. COLIN CRUDDAS worked for the Blackburn Aircraft Company as a senior systems engineer on the Buccaneer flight test program before moving to the United States where he was employed by both Boeing and McDonnell Douglas as a design engineer. 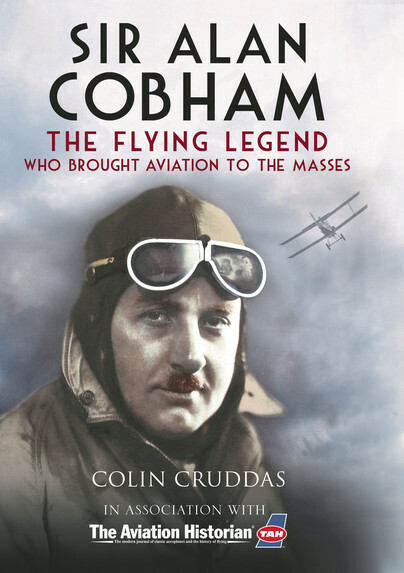 After his return to the UK, having served for many years as the official archivist of the international aerospace company that today trades under the name of Cobham Plc, Colin Cruddas is uniquely qualified to write the definitive biography of one of the greatest pioneers in aviation history.